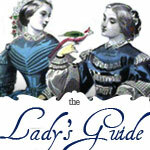 Entries categorized "Antique, vintage linens & textiles"
I'm a Victorian era textile freak. If it's velvet and it has hand tied fringe or tassels, my knees go weak. This wonderful old thing was spotted at an estate sale all balled up and shoved under a table. I should definitely know better by now but I almost didn't ask about it. 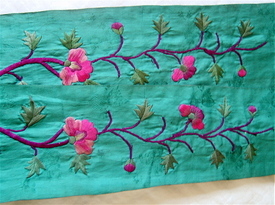 I could tell just by glancing at it that it wasn't your typical turn or the century (through the 20s) hand dyed velvet. Y'know what I'm talking about. The ones that are most commonly rectangular in shape. 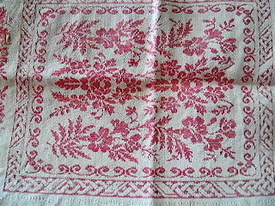 They're often table runner in size unlike this which is pretty massive. It also has hand tied tassels on all sides. I was almost positive that it's asking price would be astronomical. 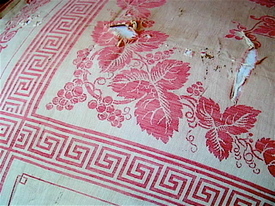 I'm guesstimating that this table cover one is from turn of the century or older. Without any type of label or the discovery of any type of identification, I can't be sure. I'm always learning, aways seeking. It may be more recent (Arts & Craft period) but for now I'm going with my gut on this beauty. Love the subdued and mottled colors, just the hint remaining of pale peach colored flowers here and there. Damage is minor and not really visible from the front. 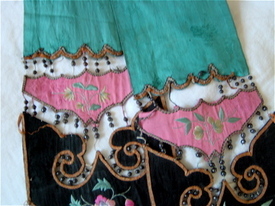 However, there is an embellishment in the center, a large embroidered rose, that appears to have been wet at oen time. I can just detect a hint of color that has run, barely. It also looks as if one of the corners may have seen a bit of drama over the last 100 years or so. Give or take a few. Take a good look at the close up below. I've found that the older the velvet, the more stiff or brittle it seems to be. Eventually the fibers start to gently fall off. I iamgine that this is partially which why so many Victorian era (velvet) items are found with "bald" spots. This stiffness may also be furtther confirmation that it was indeed, wet once upon a time. was not one of those times. It arrived literally falling to pieces and full of ancient rusting pins. No note of warning was included. "Hey. Be careful not to stab yourself with a rusty pin" would have been nice. First thing I did was carefully remove the pins one by one. an option. Every inch of this needs to be somehow stabilized. 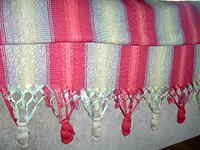 Antique textile fans out there, what do you think. Suggestions on how best to preserve this? If anyone out there can shed any light on this purse please let me know. It was purchased it from another Etsy seller a few months ago. If I recall correctly, I believe it was simply listed as a vintage purse or bag. I photographed it on top of an apron that I picked up a yard sale recently on the way to staffing the shop at Heritage House. Although the apron had a tiny bit of damage, I was quite taken with the roughness of it and it's obvious hand made construction. I don't mind the few signs of age. 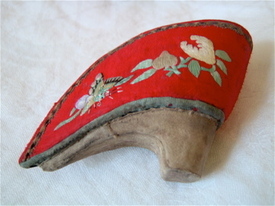 The purse is constructed of nice think velvety material. The design of the flowers is reminding me strongly of a time before turn or century but the velvet itself is shouting much later. Am I correct and the purse was constructed, oh say in the late teens from a scrap bag of older remnants? Or am I just crazy and have no idea what I'm talking about? These are the things that a I ponder. It's beautifully monogrammed on both sides, and is amazingly sturdy overall. The top and the green is a little faded but nothing to worry about. Inside the lining is still completely intact with tiny stitches here and there. Please let me know if you own a similar purse and/or any knowledge of the age if this one! He watches everything I do with utter fascination. At one time this was the lovely collar to something or other. 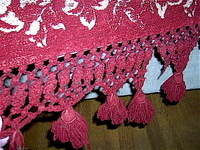 The cotton fabric surrounding the crochet work was frail and barely there. Holding it up to the light I carefully cut away the extra bits. Below you can see a close up of the one and only "flower" in pretty piece of handiwork. Here you can get a good look at what I trimming off. The fabric was so far gone that I was able to tug at it and pull some of it away with my bare hands. Time out to take a photo of the cluttered table before me. After all the trouble of trimming I suddenly changed my mind and instead went in a completely different direction. I decided to use this pretty piece of metallic lace instead. This poor piece was in even worse shape than my first choice. I had to use extra care when handling it because I actually witnessed it tearing from its own weight on more than one occasion. Carefully I salvaged what I could and gently (sparsely!) stitched it to the hat. My first instinct what to go with a deep pink rose with a matching ribbon. But wait I thought. Let me go with something a tad different. I settled upon a pale pink rose instead. I mention this not because I made some radical step outside of the box with my decision to go with a lighter rose, but because my dear hubby took one look at it and said something to the effect of "Nice dear. 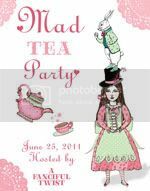 A bright and darker colored rose and ribbon would have looked great too." Of course now I'm second guessing myself. Perhaps I should have stayed with my first choice. Oh he had to go and plant that nagging seed of doubt! Oh phooey. That's crazy talk. I'll just have to embellish another hat. I think I found this beautiful Victorian hanky holder in Memphis. I am no longer sure. I only knew that when I saw it I had to have it, faults and all. I imagine that a young girl created it long ago embellishing it by dim light. It's quite large, measuring about 12 x 12 inches and is in remarkably good shape. I had packed it away in a long forgotten corner. Not too long ago I remembered it. I had also forgotten what the heck I had stuffed in it. 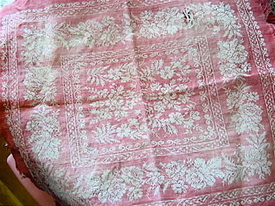 Quickly flipping open I rediscovered a lovely stash of lace hankies. Geez! 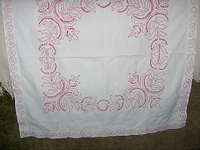 That extra lacy hanky on top was one of my very favorites. How could I go so long without missing it. This quote and the way that it was applied to this case is one reason I think that it was embellished by a child. I'm still referring to it a a hanky holder. But veils? A young Catholic girl from New Orleans perhaps? Now, none of these handkerchiefs came with the holder. Each one was discovered here and there over the many years. One of them has a hand painted butterfly. Another, a brilliant and bright bird. And yet another, the proud name of the artist Gladys O'Kelly. The silhouette of a young Miss adorns this one above. I found a vintage little pouch crocheted around the teens I bet. Can't keep everything although to know me is to think otherwise. This purse will go into my Etsy shop. If you love hankies in general be sure to click Here to zip to an previous post I did. 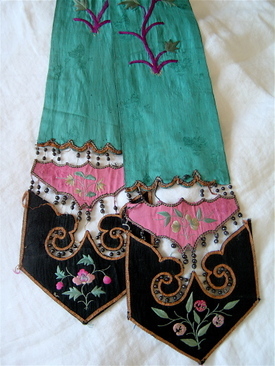 It features a wonderful hand painted "Mexican" hanky embellished with a dancing couple. Love it! Time to dig in a few more of my dark corners. I saw my very first Victorian chenille throw used as a prop in an old photograph, possibly a carte de visite, circa 1870's-1880's. My mother taught me the joys of getting comfy with a small pile of old photographs and a magnifying glass at your side. I remember the very first time I actually saw one of these in person. It was years ago at what used to be the Santa Monica Antique Market on Lincoln. I spotted the first "throw" from a distance. I remember getting all beside myself as I recognized immediately what it was. What I didn't get excited about was the $300 price tag. It turns out the same dealer had a few more of these chenille beauties draped gracefully across the store. Carefully I examined each of them and vowed that I would own one someday. Since then I have been lucky enough to put together a very small collection. 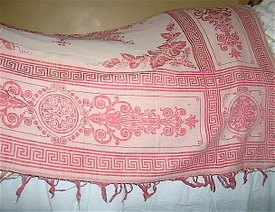 Each throw/portiere/blanket was luckily snagged on Ebay for a song. This one is especially magnificent and detailed. 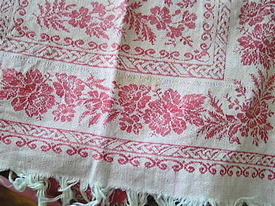 These are the type of antique/vintage textiles that often hold up very well over the years. I don't think that some people realize how much age is on these beauties. My husband likes to try and get my goat now and then by exclaiming "That's not old " about various things. The colors in this piece remain so vibrant that it's hard to tell the back from the front. Be sure to take a good look at these close-ups so that you will ready should you stumble upon one of these yourself. Remember that they were created in a variety of sizes. 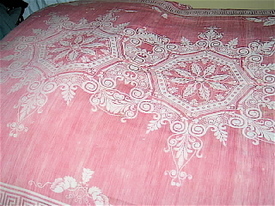 I have one sized perfectly for a small parlor table and still others that are incredibly long in size. Exceptionally long pieces which are only tasseled on 2 (opposite) ends were created to hang in doorways. I'm blanking out at the moment regarding the measurements on this. 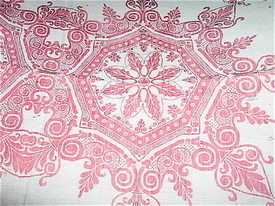 It's square in shape and certainly would work as a twin size bedspread or topper. Pretty tassels rim all 4 sides. 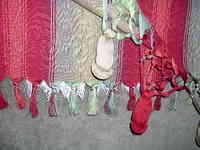 This does have 2 damaged tassels but I don't plan to even attempt to repair them. They certainly do not detract from the beauty of the piece. I used to have one that had an image of a child riding a huge St. Bernard. I sold that one but now I kick myself for not keeping it. Oh well, there is always something new and amazing to discover, right? Trying to get myself out of my creative funk, I found myself going through my stash of textile odds and ends. 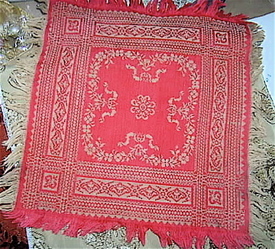 I remember how excited I was when I discovered this beautiful old turkey red tablecloth at a local yard sale. I found it so incredibly ancient and beautiful that I wasn't even disappointed in how tragically worn out it was. Finally! A piece so damaged that I won't mind salvaging it for parts! Naw. Can't do it. It is no longer red and it is so very thin and full of holes but I just could not bring myself to do it. Check out how tragic the fringe is. But oh how beautiful! Such detail. It's times like this that I wish I had one of those stucco McMansions with a vaulted ceilings. A house like this would have walls large enough to hang something like this as one would a tapestry. I live in an itty bitty falling down ranch. No room. So carefully I have folded it back up and tucked it away for now. I then moved on to these little napkins. The first felt too "new" for what I had in mind. I have two of these below and they're pretty thin and stained up but I couldn't get myself to chop em up either. Y'know. 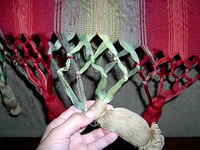 I thought that I had added a post ( many moons ago) about some of my other turkey red items but I can't find it. I just had another birthday, am I losing it already? I'll look again later and if I still can't find it, I'll take some new pictures to share soon. I was in the middle of debating a bill with a company that I hope I never hear from again. As I was placed on hold numerous times, I sort of flipped through Ebay while waiting. If you were able to click on the Ebay link above, maybe you noticed their resemblance to the the two panels in the Ebay listing. I never knew what my panels were meant for originally, only that I thought that they were beautiful. Maybe now I know. Egads. I have to pause here for a little while. My Abby is driving me nuts. She has had her breakfast and has been out to potty but now she is spinning around in circles and ramming me in the ankles with her nose. She is demanding to go out and seize the day. I'll be back later with more photo's to show. 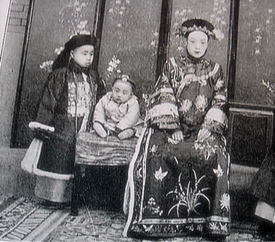 I'll also be sharing two of my books, The Last Empress from 1931 and Letters From China circa 1910. Didn't you just love the music that is playing on that Ebay listing? Hauntingly beautiful. I'm going to email the seller and see if I can find out who it is by. 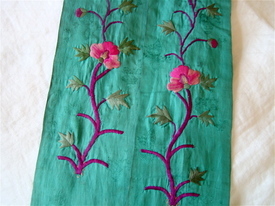 In the mean time, if you are truly a textile freak like I am, take a look at this other listing by the same seller: Wow. I almost get light headed from gazing at this magnifcent work. 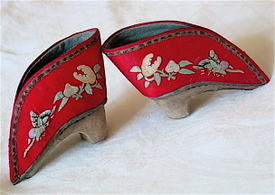 These dear tiny shoes are so very small that I can only imagine that they were made for display only. I should have taken a picture of them next to my tape measure. 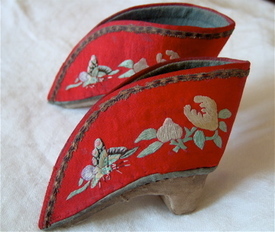 They measure just under 3 inches high and about 3 1/2 inches long. 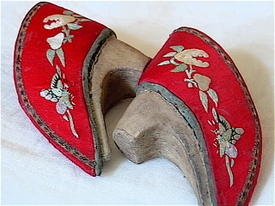 While in the shower a few moments ago, I remembered that somewhere around this house I have a 3rd old book that shows the effects on a woman's foot after wearing these types of shoes. Something you don't see every day. 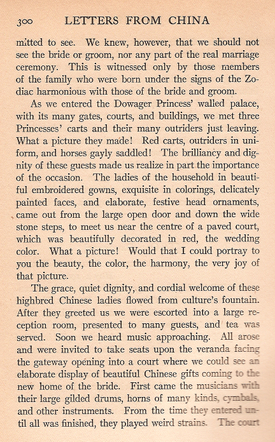 "Within the sight of the allied camp rose the fairylike pavilion of the imperial domain. The call of foreign bugles broke the silence of the empty halls scented with aromatic woods, beautified with pictures, glorified with velvets, with lacquer and with gold. 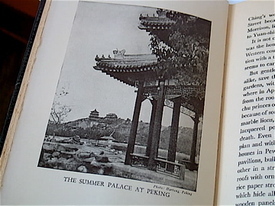 In the Summer Palace were treasures that had been collected by Manchu emperors of seven generations. And no one there to guard them." 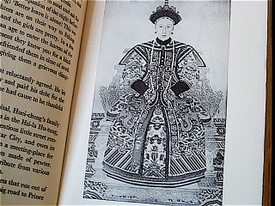 "There is still room for a book on the empress who held the fate of China in her hands for half a century." 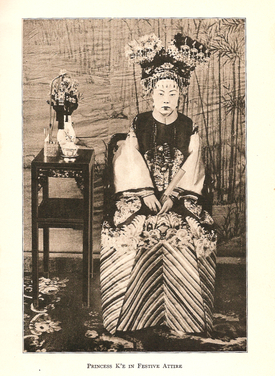 From The Last Empress, 1938. I meant to take more photos of this book but didn't get a chance and only took the last two. 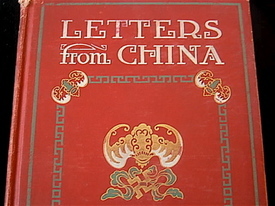 "Letters From China. 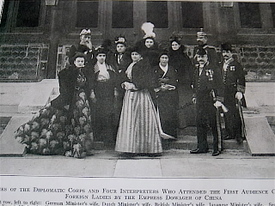 With Particular Reference To The Empress Dowager And The Women Of China. 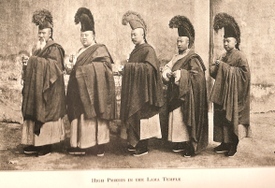 With Eighty Illustrations From Photographs And A Map." 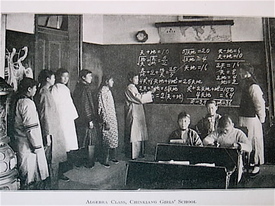 3rd Edition, 1910. This was one of those books discarded by the library. A beautiful Princess in all her finery. Pay special attention to the second paragraph and try to envision. Better yet. Pull up the WOW link up above, in another window. Then read this second paragraph with the music playing. 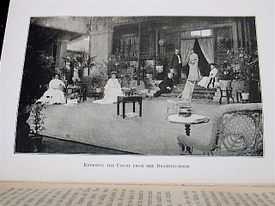 American ladies spending an afternoon in the court. What a beautiful, outrageous, fascinating, infuriating, incredible, mind boggling, confusing, sad, intriguing world that we live in. 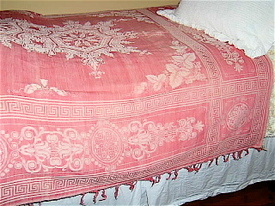 I am a big, no wait, make that HUGE fan of antique/vintage textiles and linens. What little I know about my collection is entirely self taught. Beginning today, I am going to slowly begin to add pictures on a regular basis of my collection. If anyone ever reads this who knows anything about one of my pieces, please do tell!! 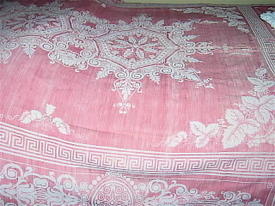 The first item in the photos is a piece that I believe was meant to be draped over a pillow. Maybe not. Maybe it is just a square tablecloth? What I would really like to know is what is this "style". I'm familiar with the "turkey red" pieces that are similar, having designs that are probably more art nouveau. But more and more frequently I am coming across this particular style, a bit more folksy? 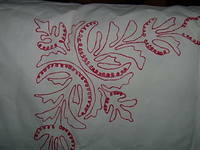 A recent magazine had a similar piece with a bird incorporated in its design, framed and hung beside the bed. Where did this style originate? Is it German? Hungarian? I am very curious to know. Oh my goodness! The next piece with the bold red and green stripes...I get all giddy just thinking about it! I actually found a pair of these at an estate sale here in town. I happened to just discover the estate sale by accident late in the day. Figuring that I was safe from temptation and that everything of interest had been picked clean already, I decided to check it out. Just as I thought that I was going to remain a good girl and walk out empty handed, I spotted this pair tossed across a day bed. Being a little familiar with these I immediately recognized the texture of the fabric. My heart started pounding. It couldn't be. They must be on hold. Something must be serously wrong with them. Scared out of my wits, I asked to see them. I was right! They were in such good condition I couldn't believe my eyes. Apparently no one else could either which is why they were still there. As I stood there examining them, I was asked by several different ladies what I planned to do with them. I got the impression that no one knew what they were. These are especially long number one. 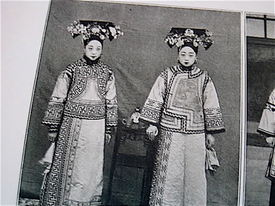 I think that they were meant for much higher ceilings and doorways than we have today. Also. Number two, If you look closely. You'll notice that the fringe is much heavier on one end. I think this was so that they could draped over a rod and hung gracefully. One lady at the sale thought they were bedspreads. Yet another thought they were huge tablecloths. No one could figure out why they were different at both ends. If anyone out there has one of these, whatever you do, DO NOT GET IT WET!!!! The color in these will run horribly! Trust me, I know the hard way. They sometimes show up on ebay and will be described as "faded" or "sun damaged." No, somewhere along the way someone tried to wash it. Even so, I think that some people are actually seeking them out this way and redying them. 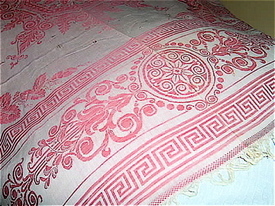 And I have seen them used as bedspreads in magazines as far back as Victoria Magazine about 10 years ago. These can be very plain or extremely elaborate in design. Photo #3 is of one that I actually won on ebay several years ago. It was one of those things that just slipped through the cracks. Somehow I was able to get for close to nothing and miracle upon miracles, no one outbid me. I've never seen another like it and I think that it is fairly unusual. And very heavy I might add. 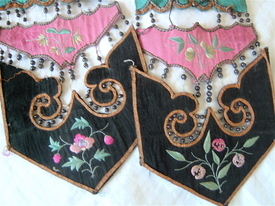 It has similar tassles to all the others although these almost feel like they are made out of some type of chenille. There is some damage but I don't mind. Someday I do plan to repair it so that the damage won't be as noticeable. Were they made here in the U.S? Are they European? Exact time period? Anybody out there know???? Anyone??? ?